We believe that knowledge is the key to education. Ross and his associates are passionate about dogs and therefore anything that we can do to protect their welfare, popularity and social acceptance is a vital part of the work that we do. Dogs are dogs and we can not alter that. Dogs bark through communication and similarly they bite through communication. As dog owners we have a responsibility to manage normal and natural dog behaviours. Whilst dogs are generally territorial – some with a greater predisposition and drive/desire to guard than others, as owners we have to manage that so that callers are not put at risk of fear or injury. Dog attacks make the press regularly and this affects ALL dog owners – our freedom to share life with our dogs is increasingly restricted as (often knee-jerk) legislation is brought in on an increasingly regular basis. It has to be our job to promote dog ownership, to promote knowledge of and safety around dogs. 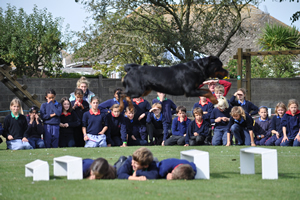 Therefore, we offer school safety visits, family placement dog assessments and workshops for all who have to deal with dogs belonging to other people within the course of their daily work.